32 pp. Applied marble cover, two stories 16 pp each. Two stories, Mary Ann no. 51 , discusses a new Sabbath school in New York and Little James no. 52, which describes a boy who memorizes Dr. Watts' First Catechism before he could read. 87 pp. Applied marble cover, 3 plates, embellishments at end of some chapters. Reuben, originally hesitant about going off to school, learns how his Bible studies can influence his daily life. 160 pp. Blind stamped, gilt brown cloth hard cover, illustrated, entirely in German. Begins with the alphabet, an illustration, the upper and lower case letter than a biblical verse, other items include the small and large alphabets, the vowels, simple syllables, and short stories. 23 pp. Brown illustrated printed paper cover, frontispiece. 16 pp. Green illustrated printed paper cover, monthly periodical, Vol. II, no 1 for January 1851, contains 2 illustrations. Inside cover lists ordering information and donations to Children's Educational Funds. Content titles include: The New Year, Julia the Heathen Girl, Hindoo Blacksmiths, Blacksmiths worshiping their Tools, The Hindoo Pilgrim, More Blessed to Give than to Receive, The Temple of Siva, The Great Pagoda of Tanjore, The First Siberian who Loved Jesus, The Rejected Idol, and A Thought for Older People. 51 pp, Marbled cover, The Cottage Girl 35pp, Frontispiece of female praying at bedside, full text; Ann and her Mother 16pp, full text with one image on first page; bound together, June 2016 OCLC-2. 48 pp. Brown blind stamped hard cover, frontispiece, illustrations. Moral stories for children with religious education and hymns mixed in. Some story titles include "A Teacher's Gift" " Flowers and Weeds" "Things that have Wings" and "The Penknife"
72 pp. Apllied marble cover, full text. Memoir of Normand Smith, born in Hartford, CT in 1800. An advertisement at the start of the book explains that this is not a eulogy but "an example for the imitation of others, who move, as he did, in common walks of life." 108 pp. Applied marble cover, frontispiece. The story of Mary Lothrop, who was taught to be pious and obedient. She talks with her mother about why her little sister died, her entry to school is discussed, and how her heart fails in the end, all while keeping her religious faith. 6" x 3 1/2"
8 pages, bound in tan paper wrapper with decorative border and circular vignette, printed in blue ink. Engraved quarter page illustration. One book from an 11-book set. 3 1/4" x 4 1/2". OCLC- 2 full sets; 0 individual (Aug, 2018) . 16 pp. Blue illustrated printed paper cover, illustrations in book, cover lists "S.H. Colesworthy: Portland" as publisher,Seventh Series-no. 7. Hymn book with short religions lessons on behavior for children. Titles include Industrious William, The Violet, To a Little Girl that has Told a Lie, and A Naughty Boy. 24 pp. Blue printed paper cover, full text, sewed binding, Number one of series, seventeenth edition. "first of a series of stories, of which it possible may be the beginning and the end" from to the reader. A story of a woman and her misery when her husband begins drinking. 8 pp. Blue illustrated printed cover, illustrations. Prayers are for "In the Morning" "At Night" "A Prayer for a Child who is in trouble" and "A Thanksgiving when a Child has recieved a favour from God"
31 pp. Applied marble cover, frontispiece. 32 pp. soft cover with string tied spine. Second edition of Fisk's Discourse based on predestination and election. The Victoria Tales and Stories Suitable for the Young: George Mills; or, The Idle Boy. Frederick Warne and Company.London. 16 pages, engraved frontisepiece. Cover is a purple wrapper with a decorative border. "Price One Penny" printed on top of border on front and back cover. Children's story with religious and moral lessons. One of a set of twelve, part of a series of such sets, each labeled with a letter to identify it in the larger series - unable to determine which set this volume belongs to. Back cover has, inside the decorative border, a list of all 12 titles in this particular set. 4 3/4" x 3". OCLC-1 (Aug, 2018).
" Printed under the direction of the committee of general literature and education, appointed by the Society for Promoting Christian Knowledge". 16 pages, bound in green paper wrapper with decorative border; engraved frontisepiece. Tells the story of the potato, focusing on it's history in England and it's relevance in one's relationship with God. 3 1/2" x 2 1/4". OCLC-1 (Aug, 2018). No Time To Serve God. Truscott, Son & Simmons.London. various paging (each story has it's own set of page numbers), embossed cloth cover, illustrations, eight (8) stories included. 128 pp. Illustrated and printed paper cover, frontispiece, full text. The Hymn Book contains hymns on the categories of creation and providence, redemption, gratitude, prayer, The Scriptures, worship, Lord's day, morning and evening, opening and closing year, for teachers, God's omnipotence, the importance of religion, time uncertain, call to repentance, repentance, death of a teacher, death, death of a scholar, judgment, and miscellaneous listed numerically with a full index in back. 152 pp. Embossed cloth cover,gilt spine, frontispiece, 2 illustrated plates, Little Anna Series. Chapters include Daisy Valley and its Inhabitants, Death in the Valley, The Hermit, and Conclusion. This is a handmade coloring book, depicting "The Lords's Prayer". The interior pages were created using a mimeograph, then the outlines were colored in by a child. The name Virginia is written on the back of the majority of the pages. The pages were then bound together using brad clips The imagery is a reflective social commentary Mostly likely this book was made during Sunday School. 9" x6". Very minor edge wear, The interior pages are slightly toned due to age. "Printed under the direction of the committee of general literature and education, appointed by the Society for Promoting Christian Knowledge". 18 pages, bound in yellow paper wrapper with decorative border; "Class 1" printed in the bottom right corner, within border; contains 3 engraved illustrations. Story of a young girl who refuses to go to school until misfortune shows her the error of her ways. 5" x 3". OCLC-3 (Aug, 2018). Produced by the The Religious Tract Society. 32 pages; green paper wrapper, cover has decorative border. Engraved frontisepiece, decorative elements on title page. Story focusing on religion, morality, and devotion to God. 2 3/4" x 4". OCLC-1 (Aug, 2018). 24 pp. Blue paper illustrated printed cover, no title page, book begins with illustration and story. "For the Sunday-School Union of the Methodist Episcopal Church"
The story of Robert and his lack of enjoyment at school, he encounters the parents of his friend Frank, a successful student, and is quoted the lessons of the Bible. Robert is very impressed and changes his ways. Short descriptions with illustrations, mostly biblical but also one with playtime and one with elephant, writing addressed to "William." Through the Woods, 1906. 33 pp. Color printed cover. By the Roadside, 1908. 39 pp. Color printed cover. Along the Trail, 1912. 62 pp. Color printed cover. On the Hill-top, 1919. 45 pp. Color printed cover. In the Valley, 1922. 53 pp. Color printed cover. This copy was published by The Harmony Shop, Boston. All are part of the Marjorie and the Dream series. They are stories for "the little girl or boy within, who never has grown up, and never will grow up." each book- 7 1/4" x 5"
251 pp. Cloth cover, fold out map on reverse of title page, 2 additional maps. Contents: The Old Testament world -- The Babylonian background of early Hebrew history -- The Egyptian background -- The early Palestinian background -- Israel's religious heritage -- The oldest history of Israel -- The later parallel histories -- The story of man's creation -- Man's sin and its consequences -- The story of Cain and Abel -- The traditional origin of early Semitic institutions -- The story of the great flood -- The traditional origin of the nations -- Abraham's call and settlement in Canaan -- The promise of a son to Sarah -- The destruction of Sodom -- Birth and sacrifice of Isaac -- Securing a wife for Isaac -- Jacob and his brother Esau -- Jacob's experiences as a fugitive -- Jacob's return to Canaan -- Joseph sold by his brothers into Egypt -- Joseph made governor of Egypt -- Joseph and his brothers -- Joseph's loyalty to his kinsman -- The oppression of the Hebrews in Egypt -- Moses's childhood and training -- Moses's call to deliver the Hebrews -- The Egyptian plagues -- The exodus -- The revelation and covenant at Sinai -- Man's individual duties to God and man -- Moses's work as judge and prophet -- The life of the Hebrews in the wilderness -- The attempt to enter Canaan from the south -- The journey from the wilderness and Balaam's prophecy -- East-Jordan conquests and Moses's farewell. 8 pp chap book. It has an illustrated green printed wrapper, with string tied binding. The author, Anna Letitia Barbauld, was a prominent English poet, essayist, literary critic, editor, and children's author. Her two most influential books for children were "Lessons for Children" and "Hymns in Prose for Children" as they were considered revolutionary in children’s literature as the books gave special for the consideration given to the needs of the child reader. Barbauld demanded that her books be printed in large type with wide margins so that children could easily read them and, even more importantly, she developed a style of “informal dialogue between parent and child” that would dominate children’s literature for a generation. Her work has even said to have not only influenced the poetry of William Blake and William Wordsworth. This particular edition is a part of a collection of 'Toy Book' published by S Babcock, and is a selection of the Hymns published in the original volume. Measures 2 7/8" x 1 7/8". 8 pp. illustrated printed paper cover, cover and title page are the same, one illustration at beginning of text. Three short writings, "The Little Graves," "The New Grave," " and "Lines" referencing the death of young siblings. 32 pp. Printed soft cover, illustrations, plates. 35 pp. Printed soft cover, illustrations, plates. A journal featuring writings, plates, and music. This Volume features a New Years Address, a plate and reading on Christ Preaching on the Mount, writings entitled The Family Constitution, Honor Your Parents, Mary's Grave, Books for Parents, and The New Year's Wish. The Fourth of July. A Tale.. American Tract Society.New York .n.d. 36 pp. Printed soft cover, hand sewn binding, illustrations. Two inscriptions dated 1829 and 1830. Two women, Kitty Potter and Sally Milman, talking of what they will see on the Fourth of July. Sally uses her religious teachings to point out the wrongs that her friends and neighbors do. 108 pp. with applied litho covers. Illustrations, decorations and cover design by Louis D. Fancher. The book is a humorous rendition, in scriptural verse, of the great patriarch's views on the wiles of women. There are four charming color illustrations, along with red boarders on each page. Measures 7" x 5"
. The covers show edge wear and some minor damage due to rubbing. The front's endpapers have minor tear and there is a signature form a previous owner. Red textured cover, interfoliata. Compiled by Thomas Houston and Alfred Bellamy, Printed by John Dow. 26 pp. Printed paper cover, frontispiece, illustrations. 16 pp. Printed soft cover, full text, originally printed in The Mother's Journal. The religious story of sweet little three year old Antoinette who befriends Loose Ben, the sixteen year old slouching, dirty fire-maker at the Nelson Hotel. Antoinette asks Ben if she loves and prays to God. He responds yes but later confesses that he lied and until that morning did not. Ben has a change of heart. Little Antoinette is then spoken of as in her coffin and covered in roses when Ben finds her again. 192 pp, blind stamp covers. A brief history of the bible originally intended for a juvenile audience. Along with the text there are nearly two dozen black and white illustrations, the majority of which are portriats of the interregnal figures of the bible. Such as Adam, Noah, Abraham and Joseph. There are approximately five illustrations of various scenes from the bible such as "Samson and the Lion" and "The Crucifixion."
. Measures 2" x 1 3/4". Moderate cover and edge wear due to rubbing. The back strip shows heavy wear. The front cover is partially detached from the text. The last interior page (it's blank) has a water stain on it, as well an signature from a previous owner. Edward Young was an English poet from the 18th century, whose most well-known poem was "Night-Thoughts." Although Night Thoughts is long and disconnected poem, it abounds in brilliant isolated passages and it found an enormous amount of success. It was eventually translated into French, German, Italian, Spanish, Portuguese, Swedish, Welsh and Magyar. In France, in particular, it became a classic of the romantic school. The poem is thought to be about the deaths of his daughter and son-in-law, and it deals with themes of morality, immortality and death. "Force of Religion", the other poem in this book is said to be about the execution of Lady Jane Grey and her husband (also known as the Nine Day Queen). 288 pp, Cloth covered board with gilt edges. Measures 3 1/2" x 2 1/4".. Cover shows moderate wear, particular to edges due to age and rubbing. Back strip has moderate to heavy wear. Minor foxing and soiling on interior pages. "In this tiny book, my dear little friends will find a great many pictures drawn from the most interesting parts of the Old Testament. I intend to say a few words about each, to explain the meaning; but there is not much room, so I must be very short. I hope my young readers will want to learn more, and will gladly turn to their Bibles [so] that they may do so." The illustrations in this book are wood engravings, and with over 40 images there is nearly one every other page. While certainly simplicity images, mainly due to their relatively small size, they are charming renditions of some of the most dramatic scenes from the Old Testament. The image of the Tower of Babel, is stamped onto the cover. The last page of the book lists other "miniature juvenile" produced by the publisher. Measures 3 1/8" x 2 3/4". Covers are soiled and show some cover wear. Additionally they are partially separate from text block. The back strip is damaged on the bottom edge. The interior pages show minor foxing and soiling due to age. There is an inscription done by a previous owner on the front interior cover. Applied board cover, peep show book-can fold out into full circle that has pop ups, color illustrations by R.T. Cowern. The story tells the tale of Jesus in a visual way by creating a 3D image. Detailed with pop up and cut out images. 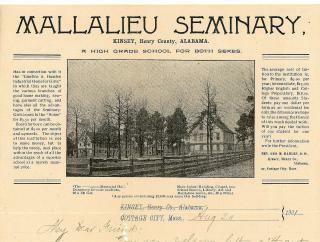 An 11" x 8 1/2" letter sheet with a large image from a photograph of the exterior of the Mallalieu Seminary, Kinsey, Henry County, Alabama. The adjacent narrative provides information on the school, it's fees and affiliation to the "Emeline S. Hamien Industrial Home of Girls" in which they are taught the various branches of good home making, sewing, garment cutting and also have the advantages of the seminar". The content of the letter written to a mother who made a 20 cent donation for a King's Daughter membership and advised their work in the South is prospering with for which we thank God and take courage. Also references the recent $5,000 and $2,000 gifts received. Concludes with discussion about the Camp Meeting and upcoming King's Daughters convention at Cottage City. .
192pp. cloth stamped boards. Miniature book. Jewish High Priest frontispiece. The book starts with an introduction to parents and Sunday school teachers and it was designed to teach children lessons of religious, historical and political truth. There are a total of eight chapters, most of which span the stories from the Old Testament. Interspersed throughout the book are over a half dozen black and white illustrations. Measures 2 1/4" x 2".. Covers are slightly soiled, and faded due to age. Binding is damaged, the covers are partially detached from the text block. The interior titled page has a small hole in it. Printed by the US Department of Transportation in conjunction with the Federal Highway Administration, the Advertising Council and the Pima Association of Governments. The poster plays off the story of Noah's Ark, and the idea that he was the first carpooler. The poster states "We Have it on High Authority that Sharing the Ride is a very good idea. Kalaka "Babylonian for Carpool". The poster is colorfully illustrated with a wooden ark pairs of animals in various colors. On the ground by the ark is a illustration of Noah, in a yellow rain coat and boots. Semi-gloss paper. Measures 22" x17". 120pp. Yellow paper wrapper. Small illustration of an alter with a bible on top on the front cover, black and white photograph of the Mennonite Publishing House on the back accompanied by a list of services they provide and their address. 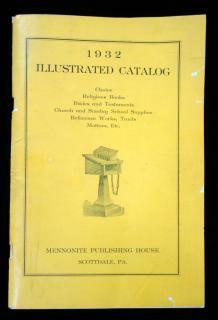 Catalog includes anything a Mennonite may need, whether they are ministers, teachers, or lay people. The majority of the items are texts, such as bibles, Sunday school books, and pamphlets, some of which are accompanied by small color or black and white illustrations of their front cover. Also includes educational materials like black boards and maps, and administrative items such as ledgers. All items have a thorough descriptive narrative providing its price, size, and relevant details. Catalog includes a two-sided 'Order Blank' and envelope with the company's name and town on it for purchasing. Measures 9" x 6". . Illustrated wraps. Pgs. 334-363. Engraving of Bay and Harbour of New York from Staten Island. Hand colored engraving of Lily of the valley and balsam flowler (sp). An original poem The Return of Spring by H. A. Del Oriend. Numerous articles including The History and Adventures of a Penny by Mrs. A. B. Whelpley, An Exciting Scene; an authentic narrative by an eye-witness and Scripture Natural History; the apple-tree,or citron (with wood engraving) . Index and advertisement on back cover. Measures 8 3/4" x 5 3/4". .
36 pp (including covers printed on crinkled paper). The front cover has a stamped red board design of Fleur-de-lys with a gild title. This is the 3rd Edition of this book, and was prepared by Mattie Pounds the National Superintendent of the Young People's Work. Each page of this book has numerous black and white photographs "showing pictures of some of the missionaries, mission buildings, natives, idols, customs, etc." What is particularly poignant about some of these photographs are the images of the 'natives' at work or in orphanages, or their 'heathen' idols. At the time of publication there were missionaries in six countries: the United States (located in multiple states but mainly the south directed towards African Americans), India, Mexico, Jamaica, China, and Puerto Rico (then called Porto Rico). Measures 10 3/4" x 7 3/4". https://photos.app.goo.gl/nv46XAxLIdVc9Cvk2. The binding staples have caused slight rusts stains at the center of the middle interior page. Minimal toning due to age. The publishing date of this book is inferred using the members of the board, and the missionaries listed in each location. von E. Escherich. Illustrirt von W. Schade. Verlag von Philipp Hergl in München . ..
Convent Life Exposed -- Great Lectures on Romanism - Opportunity to Hear the Eloquent and Brilliant Ex-Romanst, Margaret L. Shepherd. Does Secret Convession and Parochial School Education Make Good American Citizens? Purgatory Indulgences and Relics. Sacrilegious Frauds for Obtaining Money and Building Up Religious Industries. Admission 15 cents. Also includes testimonials and press notes of Margaret L. Shepherd. Back page also promotes her books. Measures 12" x 9 5/8". Excerpt from Clymer's Anniversary "Strike, Strike the lyre, let cannons roar And haild the auspicious day When Freedoms sons undaunted swore To spurn a monarchs sway"
Measures 12 1/2" x 18"
. Covers detached and separated with wear. Toning and discoloration first few pages. 12 3/8 x 7 3/4" that begins BELIEVING that evangelical revivals of religion lay a foundation for the upbuilding of the Redeemer's kingdom, and are in their very nature calculated to multiply benevolent institutions of every description; and being desirous to aid in advancing the general interests of Zion: we the subscribers form ourselves into a society and adopt the following Constitution. Includes 14 Articles with the object of the Society being to seek out Missionaries who are qualified, by the blessing of God, to promote and advance rivals where the state of religion is low, and to lead anxious souls to Christ --and to not limit the labours of its Missionaries to the County of Tolland. Reverse is blank. A journal from the mid 1850s by an unknown individual, but one who is very devout. The journal starts off as a diary, where only a line or two was written every few days. For example "Sewing Circle", "Attended Church and Sabbath School", and "Heard Dr. Jewett Lecture about temperance." As the journal progresses the entries start to grow in length. The author discusses everything from travel (to the countryside) to books that they have read, including the History of the Reformation Began by Martin Luther. In addition to the diary, there is also poems and prayers written in the book as well. These tend to be written in pencil, and have faded a bit. On the inside covers are scribbles of math, and the first page of the journal is an accounting slip which references boarders and the dates they were stayed. There are two inserts of scrap paper, one has accounting on it, and the other a cutwork pattern, a simple sketch of a branch with leaves that has been partially cut out . Board covers with applied marble, 40 leaves. Author used both pencil and ink. Near complete, few blank pages. Measures 7 1/2 x 6 1/2..
An accounting for a Ladies Sewing Society associated with the Congregation Church in Chester, VT. The author of the book changes every two to three years as a new treasurer is appointed. As such, the level of detail of the accounts varies over time. The book starts in 1853 with Mrs. Asa Davis as the Treasurer and ends in 1883 with Mrs. H. L. Slack. Additionally in 1865 the society renamed itself to "Ladies Congregational Benevolent Society." The book makes note of funds received for sale of items constructed by the Sewing Society, the dues paid by different members, and items purchased with the funds such as yarn or food. At the end of the book are three pages that list an accounting of "Pew Owners" and how much they have paid towards their ownership. This list is not dated. Board covers with applied marble. 56 leaves. Measures 7 3/4 x 6 1/4. Fine Trinket Box with Delicate Cutwork Under Glass– Naïve Alter boy . ..
A 4 1/2" x 3 3/4" sheet with a miniature hand penned and decorated Lord's Prayer and Apostles Creed. The Lords Prayer is written horizontally and measures 5/8" in diameter. The Creed is written in a circular format. Extensive geometric starburst devices around the Lords Pray and intricate geometric scolloped designs surrounding the Creed. An eternal wreath with flowers and leaves surrounds the work. Pennsylvania Dutch influence. Caption at base reads ""Being justified by faith we have peach with God through Jesus Christ our Lord Amen". Reverse is blank. Found in an envelope addressed to Miss Nellie Hughes of Slatington PA. .
. Two of the albums are 6 1/2" x 3 1/2"; the third is 7" x 4 1/2". Includes signatures from a wide variety of people, including signatures from local authors such as SC Wheeler, the Roth family, and crew members of the USRC Samuel Dexter, a ship famous for it's role in the rescue of the SS City of Columbus in 1884. . The first so-called campmeeting in what became known as Wesleyan Grove was held in 1835. In subsequent years the congregations grew enormously, and many of the thousands in attendance were housed in large tents known as "society tents." A congregation from a church on the mainland would maintain its own society tent. Conditions were cramped, with men and women sleeping dormitory-style on opposite sides of a central canvas divider. All with cover wear; loose or partially detached covers. Some soiling from handling.